President Barack Obama and Chinese leader Xi Jinping have ended a two-day summit in California, which was described by US National Security Advisor Tom Donilon as “unique, positive and constructive”. Tom Donilon said Barack Obama had warned Xi Jinping that cyber-crime could be an “inhibitor” in US-China relations. He also said that both countries had agreed that North Korea had to denuclearize. The talks in California also touched on economic and environmental issues. The two leaders spent nearly six hours together on Friday and another three hours on Saturday morning at the sprawling Sunnylands retreat in California. While briefly appearing for a stroll together on Saturday, Barack Obama described their progress as “terrific”. After the talks concluded, Tom Donilon told a press conference that President Barack Obama had described to Xi Jinping the types of problems the US has faced from cyber-intrusion and theft of intellectual property. He gave no details but said Barack Obama underscored that Washington had no doubt that the intrusions were coming from inside China. Earlier, Xi Jinping’s senior foreign policy adviser Yang Jiechi told reporters that China wanted co-operation rather than friction with the US over cyber-security. “Cyber-security should not become the root cause of mutual suspicion and friction, rather it should be a new bright spot in our co-operation,” he said. On North Korea, Tom Donilon said the two leaders had achieved “quite a bit of alignment”. “They agreed that North Korea has to denuclearize, that neither country will accept North Korea as a nuclear-armed state and that we would work together to deepen co-operation and dialogue to achieve denuclearization,” he said. Immediately after the summit ended, the White House issued a statement saying the two nations had agreed to work together for the first time to reduce hydrofluorocarbons – a potent greenhouse gas. The White House appears to be delighted by the summit, with Tom Donilon repeatedly calling it “unique”. The summit was the first meeting between the two leaders since Xi Jinping became China’ president in March. It was billed as a chance for the two to get to know each other. 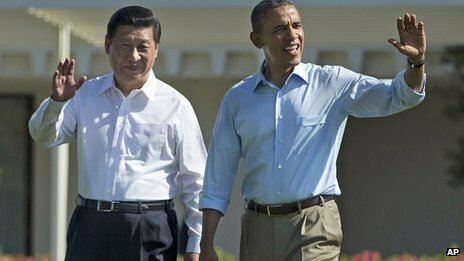 Speaking after his first session of talks with Xi Jinping on Friday, Barack Obama described cyber-security as “uncharted waters”. On Friday, the Guardian newspaper published what it described as a US presidential order to national security and intelligence officials to draw up a list of potential overseas targets for US cyber-attacks. The White House has not commented on the report. The US and China are the world’s two largest economies. The US runs a huge trade deficit with China, which hit an all-time high of $315 billion last year. Last week, the Chinese firm Shuanghui agreed to buy US pork producer Smithfield for $4.7 billion – the largest takeover of a US company by a Chinese rival. The deal highlights the growing power of Chinese firms and their desire to secure global resources. US producers want China to raise the value of its currency, the renminbi, which would make Chinese goods more expensive for foreign buyers and possibly hold back exports. Beijing has responded with a gradual easing of restrictions on trading in the renminbi. Intellectual property is also an area of concern for US firms. A report last month by the independent Commission on the Theft of American Intellectual Property put losses to the US from IP theft at as much as $300 billion a year. It said 50-80% of the thefts were thought to be by China. Ahead of the summit, White House officials told reporters hacking would be raised, amid growing concern in the US over alleged intrusions from China in recent months. Last month the Washington Post, citing a confidential Pentagon report, reported that Chinese hackers had accessed designs for more than two dozen US weapons systems. The US also directly accused Beijing of targeting US government computers as part of a cyber-espionage campaign in a report in early May.